If not, then why did these places bear his name? Ancient Indian cliff dwellings from the “Sinagua” (“without water”) people. Now that we were hanging out in Sedona, Arizona, it was time to go find out. 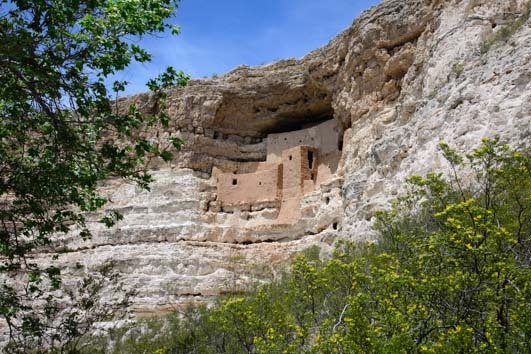 Mark had actually been to Montezuma’s Castle National Monument back in the late 1970’s, and he remembered climbing rickety wooden ladders to get up into the ancient ruins. But he wasn’t sure about the Montezuma connection. But there is plenty of water at Montezuma’s Well. As we wandered around the park now, and gazed up at the ruins, we quickly learned that these were ancient Indian ruins that had been built and inhabited between 600 and 900 years ago by the “Sinagua” people. Spanish explorers first found these ruins just 60 years after Hernán Cortés toppled the Aztec empire located some fifteen hundred miles to the south, and they mistakenly assumed that all the ancient ruins of the southwest had been built by the Aztecs. 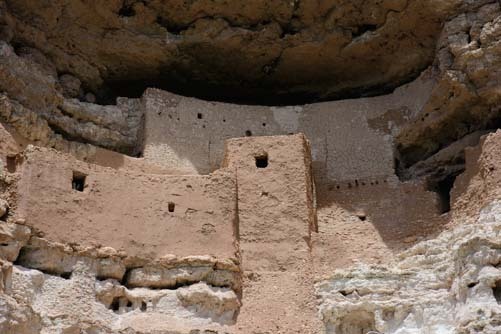 This misunderstanding carried on through the ages, and the American settlers who came to the area in the 1800’s erroneously called this ruin Montezuma’s castle. Some of the ruins at the well…plus some interesting inscriptions. Much like the ancient cliff dwellings we have visited at Tonto National Monument, Canyon de Chelly and Mesa Verde National Park, this building complex was constructed high up on a cliff, making for a very steep walk home! Until 1978, the only access for visitors was by way of wooden ladders, which is how Mark remembers it. Nowadays there is a paved path at the base of the cliffs, but no public access to the ruins themselves. 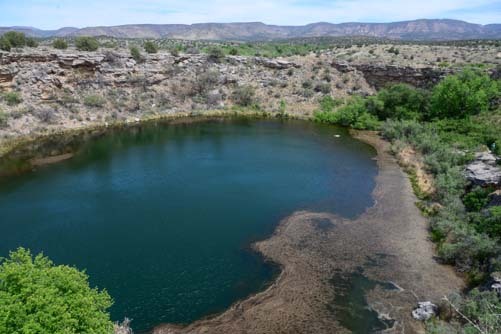 Even more interesting to us than these ruins, however, was the large pond, “Montezuma’s Well,” a few miles away. 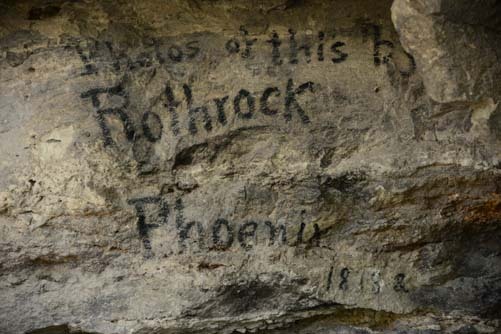 Who is “Rothrock” and why did he paint this on the rocks? There are various Indian ruins around this “well” too, but what I found particularly intriguing was the 1870’s era graffiti on the rocks. One very clear bit of writing said, “Photos of this by Rothrock,” and was dated 1878. 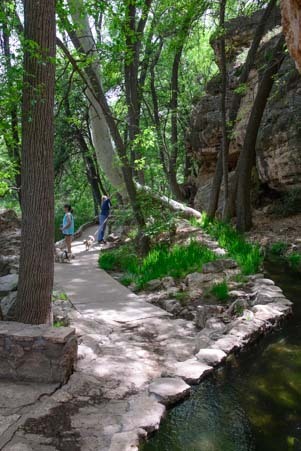 Montezuma’s Well has a beautiful riparian area where wild columbine were blooming! The National Park Service (or someone else) seems to have preserved this graffiti. It looks like it was painted just a few years ago! But I found nothing at the park explaining the name. I couldn’t wait to learn more when we got internet access back at the rig. It turns out that this graffiti was painted by one George Rothrock, a very colorful character whose personal history was as wild as the wild west he inhabited. You can download a very brief biography of this unusual man here. From ranching to gold mining to working as a store clerk, he eventually got into photography in the 1870’s. 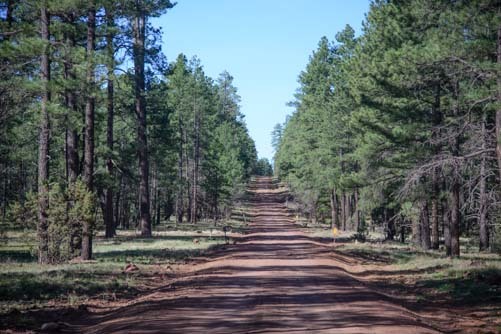 Ponderosa pine forests near Flagstaff. He proceeded to document the early Arizona Territory on film, from giant saguaros to ancient Indian ruins to the Grand Canyon. 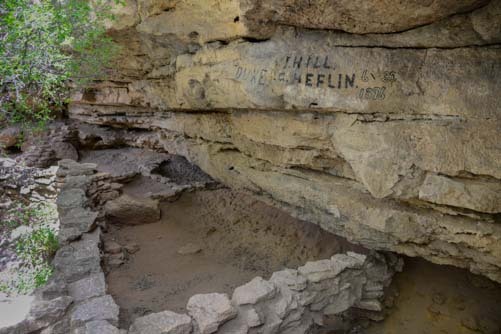 He advertised his photographs by painting his name on popular tourist sites around the state, and so it was with this signature on the rocks of Montezuma’s Well. 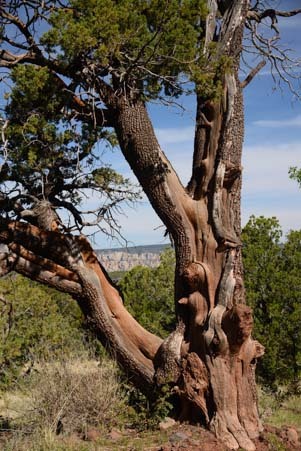 We saw some wonderful, old twisted trees. This clever marketer was trying to lure customers to his photography studio back in Phoenix!! As soon as red rock country begins, we share the road with jeeps! Leaving the oddities of Montezuma and Rothrock behind us, on another day we took a scenic drive down Schnebly Hill Road. 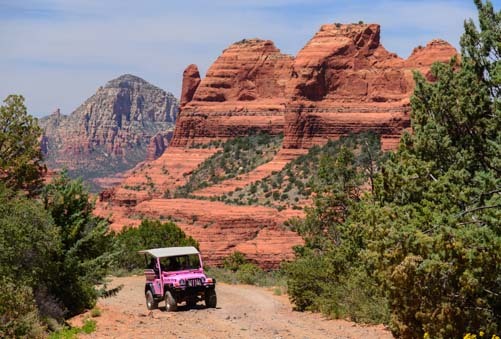 We have often blown past the sign for “Schnebly Hill Road” on I-17 in an all-fired rush to get to Flagstaff, yet the lower portion of this road is one of the most popular jeep tours from Sedona. Schnebly Hill Vista – What a view!! This viewpoint is a great spot for photos! This scenic drive has the most dramatic views going from east to west, with the red rocks of Sedona lighting up in the morning sun. So we started in the cool ponderosa pine forests just south of Flagstaff and descended a few thousand feet into the red rocks. 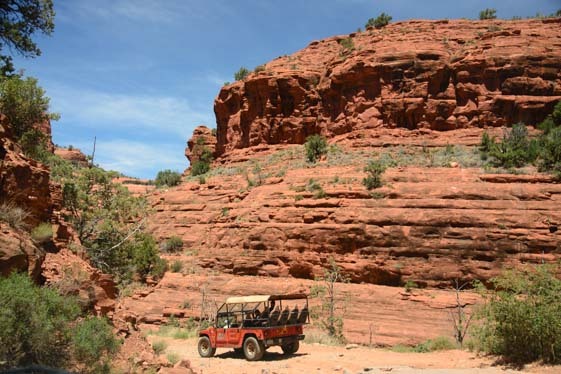 Once we were out of the pines and Sedona’s red rock views began, the road deteriorated from an easy passenger car ride to a challenging 4×4 rumble-bump. And the jeep traffic was thick!! As soon as one jeep disappeared into a cloud of dust behind us, we came across another one ahead. But the laughter of the folks being bounced around in the backs of these jeeps was infectious, and the view at Schnebly Hill Vista was outstanding. We just had to get a few pics of ourselves with that stunning backdrop!! 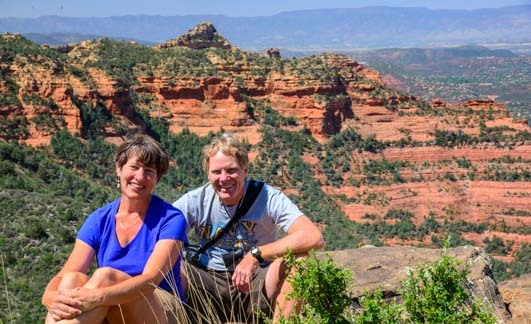 We loved our stay in Sedona, and in our two-and-a-half weeks there we had barely scratched the surface of what there is to see in the area. This entry was posted in Arizona and tagged Ancient Ruins, Ancient Ruins Southwest, Arizona, National Parks US, New, Sedona Arizona, Travel, USA, WP Travel by Roads Less Traveled. Bookmark the permalink.